About a third of patients in hospital will be given an antibiotic, and so it is important that you know how common infections are treated. Specifically, you need to know how different organisms are classified, which bacteria are most likely to infect different parts of the body, and which antibiotics are effective. Check out your knowledge on bugs and drugs using this quiz. Please select 'practice' as your game mode then click Start Game. There is also a 'click and drag' quiz here. Depending upon how you do, you might like to read on. Alternatively, you can skip to the next page. There are several different ways to broadly classify bacteria. In a clinical setting they are grouped as Gram positive, Gram negative and atypical according to the structure of their cell walls or where they live. They are also distinguished according to their oxygen requirements as anaerobes or aerobes. Look at the table below and write down an example of each that you have encountered in practice, then click to check your answers. There are some exceptions such as Mycobacterium tuberculosis which is Gram positive but it doesn’t take up a Gram stain. This is because its cell wall contains lots of mycolic acid. Remembering what bacteria are likely to infect different body systems is important, especially when making decisions about antibiotic therapy empirically (‘blind’) or before laboratory sensitivities are available. There is no easy way to remember this, but the picture below illustrates in general what bacteria are found where. What is the most common infection you see on your ward? What is the causative organism and what body system does it affect? As a pharmacist you need to have a working knowledge of the spectrum of commonly used antibiotics. 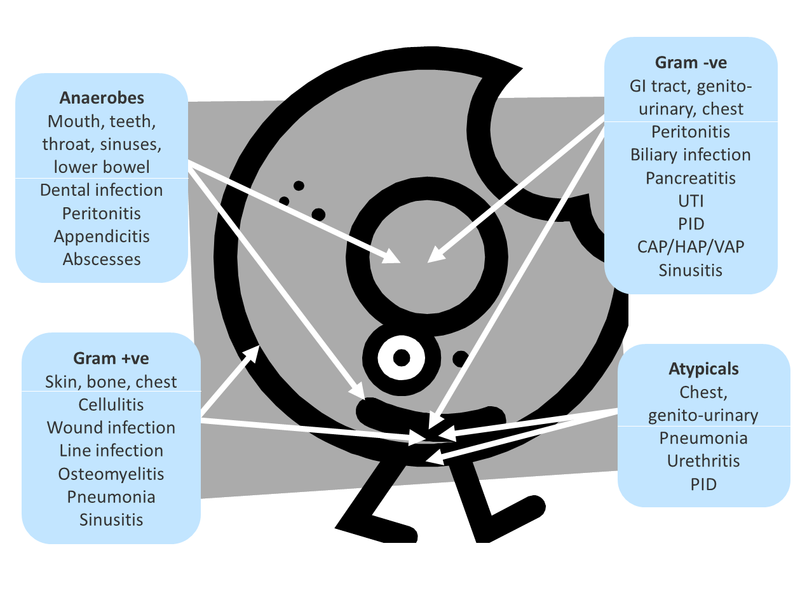 It is difficult to group drugs according to their activity against different pathogens; some only cover Gram positive or Gram negative organisms, but others may cover mostly Gram negative organisms but have some Gram positive cover (e.g. ciprofloxacin, gentamicin), or vice versa (e.g. rifampicin). Therefore the following table lists antibiotics according the groups of pathogens against which they show most activity. Used only or mainly for Gram negative ? Again this is difficult to memorise – you may like to keep the table to hand, but don’t use it in isolation; ALWAYS check your local guidelines. Inappropriate use of broad-spectrum antibiotics is associated with the selection of resistant bacteria and the induction of Clostridium difficile infection (CDI). Their use can also cause long-lasting harmful changes to the body’s protective microbial flora. Cephalosporins, ciprofloxacin, clindamycin and co-amoxiclav (‘the 4Cs’), and piperacillin-tazobactam and the carbapenems have been most strongly associated with CDI, but all antibiotics should be avoided unless there are clear clinical indications for their use. Indications for using broad spectrum agents include life-threatening infection (e.g. neutropenic sepsis), significant risk of a resistant pathogen (e.g. recent hospital admission, care home resident, recent exposure to antibiotics), or on advice from a microbiology doctor. Antibiotics should always be used for the shortest duration possible that gives an appropriate clinical outcome.